For one hour last Saturday evening, the veil was raised on the lobby of 60 Hudson Street, revealing one of the city’s extraordinary interior spaces. The building’s management, Colliers International, opened its doors—long closed to the public—to the Friends of Duane Park and some 75 people who had bought tickets to its third annual Groundhog Day fundraiser. One of the city’s few buildings that have both exterior and interior landmark designations, 60 Hudson Street—the former Western Union Building—is one of the country’s most important hubs of internet interconnectivity, housing more than 100 telecommunications tenants and their countless miles of fibre optics cable and many tons of equipment. 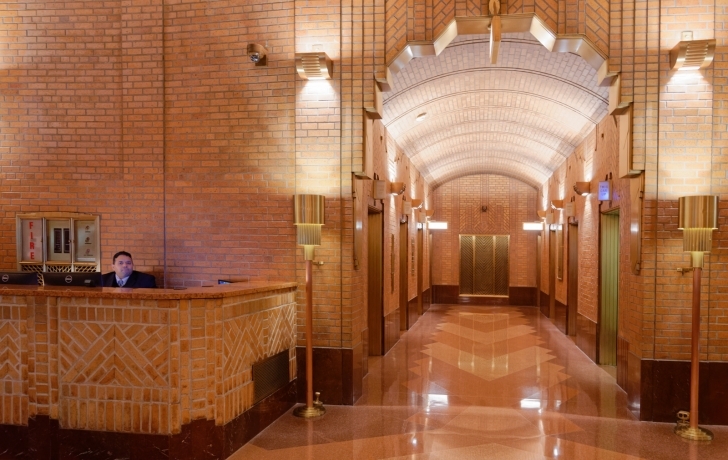 The heavily secured lobby, with its patterned brick walls, vaulted ceiling and shiny terrazzo floor, stretches between Hudson Street and West Broadway, with proscenium-like entryways of brick and bronze at each end. Built between 1928 and 1930, the Western Union Building was the third communications building designed by Ralph Walker (the first being 100 Barclay). Even when it was built, “it was the most wired of its time,” said George Boyle, the architect who has been in charge of adapting the building to its current uses. Boyle spoke to the group about the 23-story skyscraper’s history and design, noting that the lobby, one of the first fully brick interiors, repeats many of the Art Deco flourishes of the facade. A lavish apartment was also part of the Friends of Duane Park tour, but this was the first year that the fundraiser included a visit to a commercial space. To gain permission, Friends board member Robin Clements said he “started at the top,” writing to Richard Czaja, the co-president of Stahl Real Estate, the holding company that owns the building. “I knew I was launching a missile in an unknown direction and I thought it would fall to earth,” he said. But instead, Czaja wrote back and agree, even offering to provide the catering. Parker-Davidson noted that those who remembered the days when the lobby was open to the public (often enjoyed as a stunning, sheltered shortcut between West Broadway and Hudson) “were keen just to be in the space, and thrilled to be able to share their past experiences there.” Others were fascinated to learn about the building’s history, and appreciate its architecture for the first time. “It’s a special place,” she said.